One of Deep Black Sea’s greatest strengths is its foundation of plausibility. In a nutshell, the United States elects a new president who effectively guts NASA’s funding for a mission to Mars in favor of pursuing deep-water research. While such a broad and far-reaching decree in a democratic society is unlikely, it isn’t an unfamiliar point of consternation in the scientific community: the idea that we should understand our own planet before we explore others, and we still know so little about life at the bottom of the ocean. Tipping the scales in such a way has predictable effects within David Salkin’s scientific community, and it serves as one of the main points of conflict in Deep Black Sea. 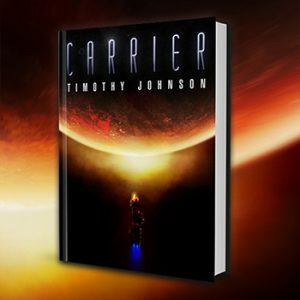 One of the crew elected to the Challenger mission is a NASA scientist, and while he publicly shows there’s no hard feelings and that he sees the project as a way to further NASA research in the long run, we know he’s still resentful that his Mars mission was scrubbed. And any psychologist will tell you that pent up resentment is just the worst, and these people are going to spend a year in a big metal ball 20,000 feet below sea level. Talk about pent up. To a layman in regard to all of these scientific areas, David’s science seems reasonably authentic and plausible. It’s clear he’s stretching for some things, but stretching the truth is often the heart of good fiction. There is a romance element that I didn’t fully buy. Put a co-ed team of people in a metal sphere at the bottom of the ocean, and there’s bound to be some hanky panky. Yes, these are the top minds in their scientific fields, but they’re also human. Sure, they should act professional, but they’re also human. While I feel the romantic relationships happened a bit fast and became the focus of more scenes than my tastes would prefer, they were fun and offered relief from the tension that brews on the ship. And in a sense, we share that experience with the characters because that tension is specifically why they seek the comfort of others. It’s interesting. I could see some readers being turned off because the characters in Deep Black Sea aren’t stereotypical scientists. They aren’t dry and boring. In fact, they love their whiskey and embrace more than eyeballing their microscopes. They can cook. They can joke with each other and pick on each other. Yet, they still geek out when they make discoveries related to their fields. In a way, that’s what Deep Black Sea is all about: my science is more important than your science. But what’s great about Deep Black Sea is the science never really gets in the way of the story. That is, often in sci-fi, the science can sometimes distract us from the fact that the important part of the story is the story. David Salkin never mires us in pages of textbook-worthy writing. He gives us just enough to get on board, and then he takes us for a ride. Beyond the characters, Deep Black Sea does some really interesting things. It’s probably apparent that there is a monster or monsters involved here, so I don’t think I’m spoiling anything by saying that much. Honestly, though, I really enjoyed Deep Black Sea’s monster(s). I thought the way David Salkin handled the horror and thriller elements was especially inventive and interesting. It’s somewhat unique and certainly offers a welcome break from the usual incarnations of monster archetypes. 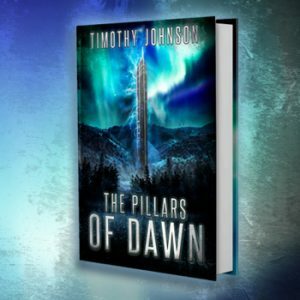 One rule I have for sci-fi is that the story has to demand the setting. Considering what David Salkin apparentely wanted to do here with the horror aspects, the story had to take place in the deep black sea. In the end, it’s all about the book’s strengths. 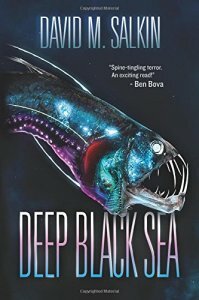 I think if you’re a thriller or sci-fi fan, you will probably like Deep Black Sea. If you’re someone who criticizes CSI for the freedoms the show takes with the forensics field, you may be looking for something more technical. Tagged David Salkin, Horror, Romance, Sci-Fi, Thriller. It’s a territory unexplored in much fiction too. “Sons of the Ocean Deep” came out in 1952 and reminded me of many of Heinlein’s works. There were a couple of deep sea Tom Swift books that I also read in junior high. There have been a few more recently. I’m looking forward to reading your book. Jeff, it’s indeed interesting how overlooked the ocean is. Ultimately, I’m a proponent of space exploration, but David’s book suggests we could actually find something in the deep black sea that proves to be integral to our future scientific endeavors, whereas some may view it as a dead end. To me, it’s fascinating on a psychological level. Thanks for checking out my work.